A bid to build more than 300 flats and a hotel in the heart of a town has been rejected. 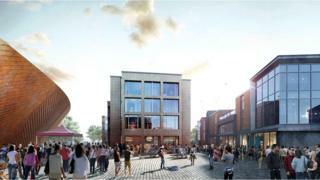 Colchester Borough Council's planning committee said the plan for St Botolph's Quarter was "poorly designed" and "out of keeping with the character of the conservation area". It also said there had been a "lack of public consultation" over the derelict Painters Yard site. Developer Alumno Group has six months to appeal against the decision. Last November, more than 50 campaigners staged a peaceful protest at the former bus station site to complain about the planning application. They claimed it would harm the "cultural heritage" of the area, which is close to the town's Roman wall. Labour activist Victoria Weaver said: "People would love to see the site redeveloped, but not like this."